Barbaro will be remembered for his six, first-place finishes, including the 2006 Kentucky Derby which he dominated by 6 1/2 lengths. Two short weeks later, with whispers of Triple Crown possibilities at a full roar, he shattered his leg in the Preakness. The heroic struggle that followed created a swell of national attention and support for this racing champion. The memorial in front of the Museum celebrates Barbaro's courage in the face of a year-long struggle against his injury and resulting infections. Barbaro brought the passion for racing beyond the industry… igniting emotion in children and inspiring those who had never seen a race. The bronze statue, created by Kentucky artist Alexa King, showcases Barbaro and jockey Edgar Prado in mid-flight between strides nearing the finish line in the 2006 Kentucky Derby. 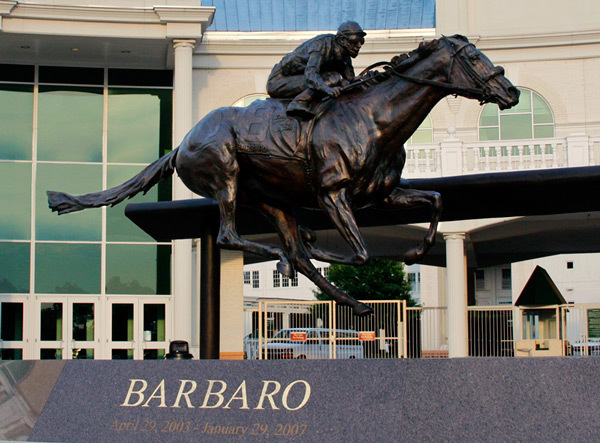 The statue is attached to a horizontal bronze rail that supports the 1,500-pound sculpture and creates an impression that Barbaro and his rider are suspended in air. It is the first time that an equine statue of this size and scope has been presented in this manner, with all four of the horse’s feet off the ground. Barbaro’s ashes were interred beneath the memorial. The sculpture was dedicated on April 26, 2009.